Interesting day – Ian Fraser, Tom Harper, Richard Brooks all aware of FRC conduct. Interesting day of research (always for the book) and many thanks to Ian Fraser, Tom Harper and Richard Brooks, for pointing me in some interesting directions, especially with reference to my recent blogs. Paul has been out all day helping someone with a long running case against HBOS. When he came home, he asked if there were any interesting e-mail or tweets. I said Tom Harper tweeted me an article by Mark Kleinman about: The Chancellor has ruled out a sale of Lloyds shares to the public ahead of the next general election, Sky News can reveal. I said to Paul (and I said on twitter) I didn’t think this was wise. If I was the Chancellor, I would off load those shares asap. As always, Paul pointed out the folly of my logic. I have just posted a document suggesting the lack of transparency over the HBOS/RBS ELA and the HBOS-Lloyds issue was, potentially, out of order and maybe even fraudulent. Imagine – the Government sell the shares in Lloyds now and then, down the road (and before the election) a scandal – any scandal – breaks about criminal conduct by the senior management of Lloyds Bank or its sick puppy HBOS, that causes the share price of Lloyds Banking Group to drop just after thousands of people have bought shares? Add that to what has already happened. Catastrophe. It’s not impossible in my view. I think Tom, like Paul, has considered this possibility but me? Well I was so deeply immersed in other research, I didn’t add 1 + 1 up. So well done Mr Osborne, you clearly are wiser than I thought. The FRC has form when it comes to letting ‘Big Four’ accountancy firms — Deloitte, Ernst & Young, KPMG and PWC — off the hook. On April 11th, The Times’s Alex Spence revealed that the Financial Reporting Council had decided against probing ‘Big Four’ firms’ pre-crash audits of UK banks, simply because it wanted an easy life. Sir Steve Robson, one of seven RBS non-executive directors to be purged last month, is facing calls to resign as non- executive director of the Financial Reporting Council (FRC). If Robson remains in his post, critics suggest the FRC could lose credibility. At RBS he was partly responsible for one of the largest bank collapses in UK history. “The whole civil service ethos is that Caesar’s wife is above reproach,” said Robert Bertram, a corporate lawyer with experience as a non-executive director of listed companies, who served as a member of the Competition Commission. So, an interesting and worrying day. I keep thinking I have discovered important and interesting information. But of course the real ‘investigative journalists’ – and ian, Tom and Richard are three of the best – already know a lot of what I’ve discovered, they’ve published it and, the powers that be have ignored it – so I’m in good company. Operation Hornet (2013-2014) – advising Attorney General, CPS and Thames Valley Police on prosecution of bankers at leading financial institution and other businessmen for corruption, money laundering and fraudulent trading. The forthcoming trials concern an alleged £245m fraud. As I said, an interesting day. This entry was posted in bailouts, Bank of England, Banking, Banks, FRC, Gordon Brown, HBOS, HM Treasury, JP Morgan, Lloyds Banking Group, Rights Issue, Sir Win Bischoff, Tom Harper and tagged bailouts, Bank of England, bankers, banks, Clifford Chance, FCA, FRC, Gordon Brown, HBOS, HM Treasury, Ian Fraser, Independent, Lloyds Banking Group, Private Eye, regulators, Richard Brooks, Rights Issue, Sir Win Bischoff, Sunday Times on August 13, 2014 by SME Alliance. Sir Win Bischoff – Chairman of the FRC and also a Chairman of JP Morgan. The Revolving door to La La Land is spinning off its hinges. I note it has been announced in the press today (12th August) that JP Morgan has appointed Sir Win Bischoff as chairman of its main legal entity in Europe, the Middle East, and Africa. 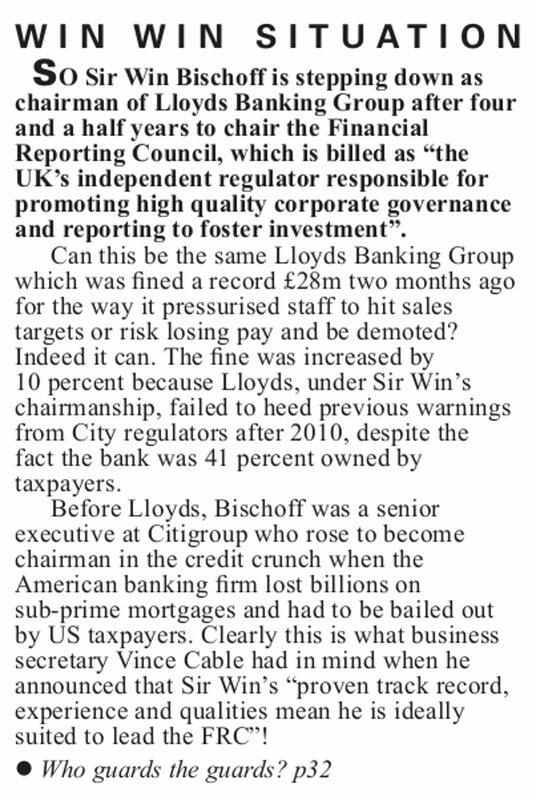 And here was me thinking Sir Win was out of Banking (he retired from Lloyds Banking Group Plc, Bank of Scotland Plc, HBOS Plc and Lloyds Bank Plc, on 3rd April 2014) and into regulation (he became chairman of the Financial Reporting Council (FRC) on 1st May 2014). Then I realised I don’t really know what the FRC does – maybe it’s not a regulator in which case, being a chair at JP Morgan and also at the FRC, might not be the “fox in the chicken coup” scenario it seems. Basis for the Preparers: Levy Section 17 of the Companies (Audit, Investigations and Community Enterprise) Act 2004, as amended by Part 44 of the Companies Act 2006, confers a power on the Secretary of Stateto make regulations enabling the FRC to recover its costs through a levy. Thus far, thispower has not been exercised. The FRC’s responsibilities are funded through non statutory arrangements on the basis of an understanding with the groups subject to the levy. However, should a voluntary approach prove unsustainable, the FRC will formally request that the statutory power be invoked. And all of that is over and above the number of shareholders and investors waiting to sue Lloyds Banking Group over the merger with HBOS, the rights issue or just ripping them off in general. “US bank JP Morgan Chase has agreed to a record $13bn (£8bn) settlement with US authorities for misleading investors during the housing crisis. It is the largest settlement ever between the US government and a corporation. To me, these latest appointments for Sir Win are not just the normal ‘revolving door’ scenario, this time the door has spun off its hinges and is now endlessly spinning at the gateway of La La Land. And, as if this could not get any more illogical, I checked out the other Board members of the FRC and found former members of KPMG and PwC, a managing partner at Clifford Chance, a former MD at JP Morgan, a retired head of E&Y, the Chief Executive of Standard Life and the former Deputy Chair of Barclays, who is now Chair of Legal and General. I kid you not, these are the people who will keep our major companies, corporations and their auditors in check. Are we ever going to see this madness stop? And of course I have my own personal reasons for doubting Sir Win’s ability to preserve ethical or high standards. Something to do with the 3 D’s – delay, deny, dilute for 3 years, then a criminal investigation for the next 4 years and a false bank account paying a £1000+ per hour lawyer to ensure (amongst other unethical things) my family were homeless. But that will all come out in the wash. This entry was posted in Banks, FRC, HBOS, JP Morgan, Lloyds Banking Group, Sir Win Bischoff and tagged banks, Clifford Chance, FCA, FRC, HBOS, KPMG, Lloyds Banking Group, PwC, regulators, Sir Win Bischoff on August 12, 2014 by SME Alliance.